An absolute indication of early spring is a plethora of broadleaf weeds like dandelions in full bloom. Although they may have a few benefits, they are a nuisance to many because they invade desirable plants, grow long taproots, and pull most water out of the lawn. 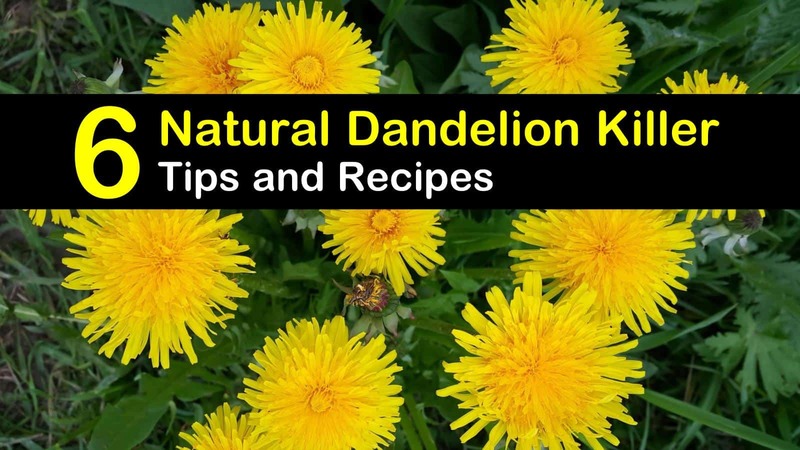 This article discusses how to make a natural dandelion killer and have a healthy lawn – weed free. Many people do not get enchanted by dandelions because they seem to pop up overnight even after being cut by a lawnmower and they take over the whole lawn. Regardless of soil conditions, they are excellent at scattering their prolific dandelion seeds as the wind carries their light, parachute-like seed heads and bring a ubiquitous threat dominating grass lawns. Just like how boiling water can kill ants and certain microorganisms, it is also an effective weed killer. All you need to do is bring the water to a boil and pour it over dandelions. Make sure it reaches the roots. Within four hours, the leaves will start to turn brown. Once they become brown, pull out the dandelion roots, and problem solved! Corn gluten is a pre-emergent herbicide. Pre-emergent means it is applied before weed seeds germinate. For best weed-killing results, apply twenty pounds of corn gluten per 1,000 square feet into the lawn. Then lightly water it to help absorption of the corn gluten. Be sure to apply only in areas where you have unwanted plants because it may kill not just the dandelion seeds but other plants as well (..). Rubbing alcohol, a.k.a. Isopropyl alcohol is useful in destroying dandelion weeds. It works by sucking the moisture from the dandelion’s leaves which eventually kills the weed seeds and the plant. Mix the ingredients, spray on the dandelions, and reapply if they haven’t withered after three to six hours. Take note, however, that we only recommend alcohol mixture if your dandelion problem is just a few square feet. If your lawn has a lot of dandelions, try the following recipes to save money. For those who do not want to utilize dangerous chemicals to kill weeds, you can still make a homemade dandelion killer using vinegar. According to many studies, such as ones conducted by USDA, the benefits of white vinegar are countless. Vinegar is useful in pest control and removal of unwanted plants. And because white vinegar contains acetic acid, it has natural herbicidal properties. Just get a spray bottle, fill it up with undiluted vinegar, and spray it on the dandelion plants. Another effective dandelion weed killer that does not involve the use of chemical herbicides is a mixture of vinegar and dish soap. The dish soap helps to get rid of dandelions by making the mixture stick better to its yellow flowers and leaves. It is best to spray it on dandelions if no rain is expected in the next couple of days so rainwater won’t dilute the mixture. Perennial weeds such as dandelion plants are sometimes not easy to defeat. Some homemade weed killers may work initially, but because new seeds get distributed easily, they continuously propagate in a large area. If vinegar with dish soap is not that effective for your lawn weeds, try to use a stronger natural dandelion killer. Mix all of the ingredients above, get a spray bottle and start spraying in your lawn areas. Killing dandelion weeds does not necessarily mean using toxic chemicals. A homemade dandelion killer is yet another way for weed control. Whether dandelions bother you in your lawn or with your hobby in organic gardening, we hope that the tips and recipes we have listed above can help you get rid of dandelions. 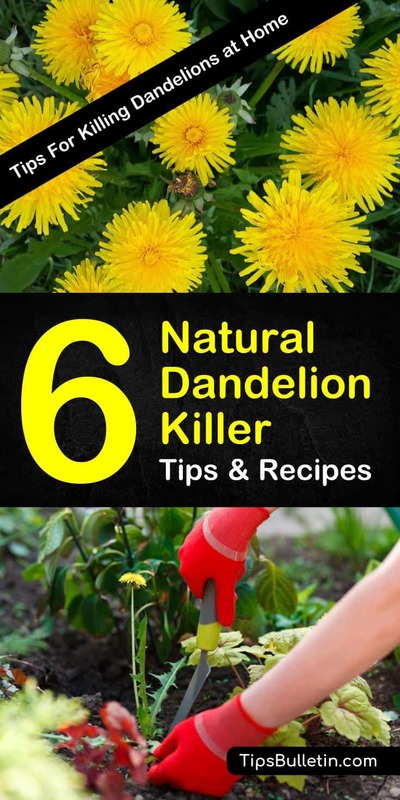 If you found this article about natural dandelion killing tips helpful, don’t forget to share these tips with anyone who might be interested to know how to get rid of dandelions. Remember, sharing is caring.